The joy of this small Acer variety is in its striated snakeskin-like bark, hence why its common name is Snake Bark Maple! The bark is smooth and olive green with cream and brown vertical stripes. The distinctively shaped, three pointed foliage, attach to the stems by a bright red petiole, and turn from green to various shades of red, orange and yellow in autumn highlighting the long green fruits. Small yellow-green flowers emerge in spring. Despite all of these glowing attributes, it is the grey-white striped bark that is the best feature of this lovely small tree. The tree itself is spreading, with a vase shaped crown, with red tipped branches which arch to a gently weeping effect, making this a structurally beautiful tree. Expect an approximate height and spread of 5 x 4 metres in 20 years. This tree was introduced from Japan in 1892 by Charles Prague Sargent, the first director of Harvard University's Arnold Arboretum. Our pot grown Snake Bark Maple trees can be planted at any time of the year. Prepare your planting site by removing weeds and grass within a metre of your desired planting hole. Dig a square hole as deep as the root mass and roughly 2x as wide. To help the tree establish more effectively, sprinkle root grow in the hole. Remove the pot, gently loosen the roots and place into the planting hole. Mix 50% of the original soil with 50% compost, fill in the hole and firm around gently. Avoid banking the soil up around the collar of the tree. 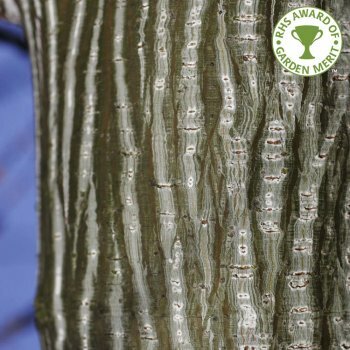 We recommend planting Acer capillipes Snake Bark Maple trees with a staking kit. For single stakes, knock the stake in at an angle and use a buckle tie with a spacer to prevent chaffing. For more advice, visit the help section. If you’re planting Snake Bark Maple trees in spring or summer, water well for the first few months. Increase watering if there are extended periods of hot or dry weather. If planting in autumn, you may only need to water a little. Acer capillipes Snake Bark Maple trees are easy to look after and do not require a lot of pruning. Remove any damaged or diseased branches when the tree is in leaf or just after leaf fall. This will prevent bleeding, which although it is not detrimental, can look unsightly. When pruning, make sure to maintain an even framework, step back and assess your work and prune proportionately.